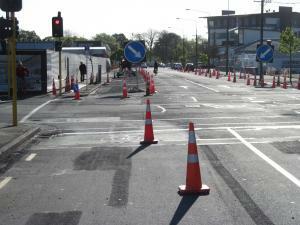 City Care have coned off the shoulder on both sides of St Asaph St between Antigua St & Stewart St. With the segregated westbound cycle lane finishing at Antigua St, this forces cyclists out into the general traffic lanes before they reach the reach the next section of cycle lane just before Hagley Park. Unfortunately there is no advance warning of this, with City Care only putting out a “Roadworks on Side Road” sign, which certainly doesn’t advise of cyclists merging & being in the “car” lanes for the next 200m. Surprisingly, this is all going on immediately past the Christchurch Central Police Station. Makes a total mockery of their current advertising campaign: “NZ Police – Committed to Safer Roads” (unless you’re a cyclist …).